To my eye, the grab rails as built from the plans appear at risk of damage should a stronger or heavier crew member forcefully jerk on them. I think the photo shows what I mean. 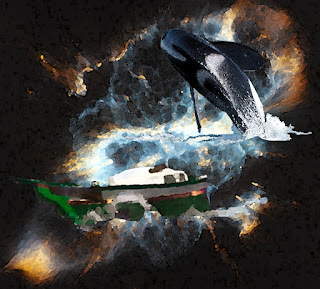 I have not researched any actual instances of this occurring, but since I am building my boat... I hasten to add that I very much like the work—especially how the lines were run—that this builder did. I have no reason to fault any builder for following the plans. Below is a shot of the rough-cut stage I made yesterday. 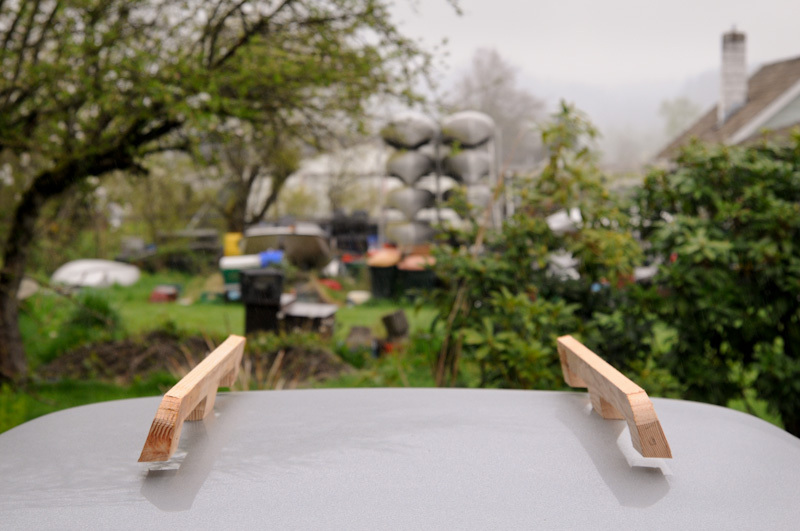 The bases are doubled in width; the tops are 25 percent thicker. And I made them half an inch taller to accomodate a modification to my hatch. I have filled 28 9x12 inch pages with pencil drawings using my own attached digits—fingers. Today I dusted off my copy of Illustrator CS3 to see what I could do. Here is the result, a top view of my cockpit modification ideas. The gray boxes on the left are what remains of the original plan's bench seats. 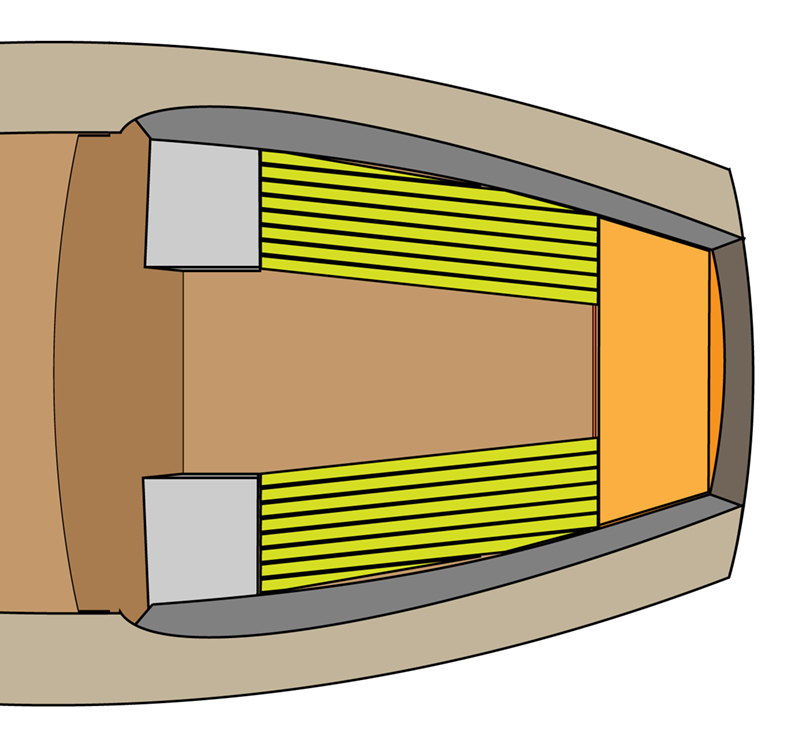 The orange area on the right is the lazarette with a hatch at the height of the yellow park bench style slats in the middle. These colors are NOT what I will be using. 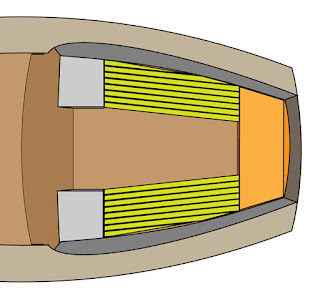 They were chosen quickly from the palette in Illustrator to distinguish the different parts. A subtitle for this blog entry could easily be, "It's not what you know, but who." 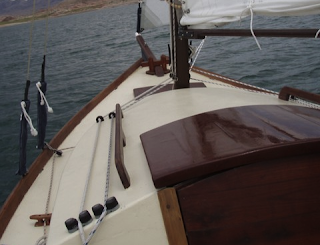 "Building around the edges" refers to what I can construct with very little money while I work to change my available resources that will enable me to lay the keel, buy epoxy and marine plywood and so forth. My tiller purchase is an example of this approach. But now I have a completed clubfoot boom waiting for finishing. The boom sits on a table saw in the wood shop where my son attended high school. 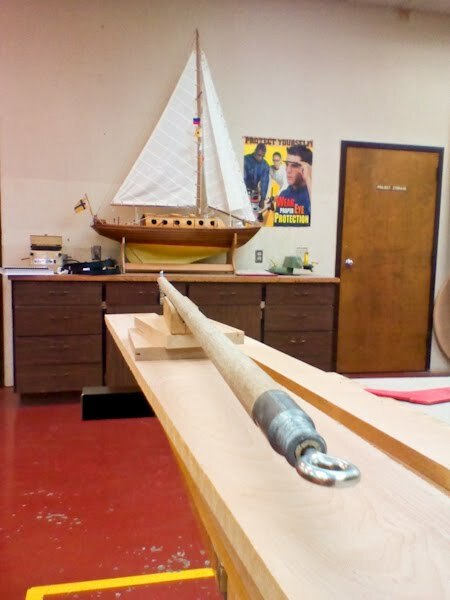 The large sailboat model in the background also has a clubfoot boom. The shop has a drill press which I knew I needed to make the holes for the eyebolts at the aft end that you see here. I also knew I needed the expertise of the instructor (who built the model)! Turns out, I had no idea how much Tom's knowledge would help me. Notice how nicely centered the screweye is in the end of my (former) broom handle. 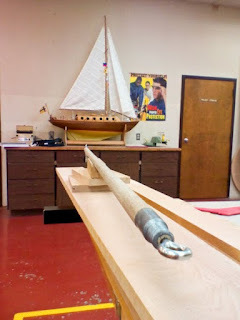 Tom had his very capable student worker, Michael, place the business end of my boom in a metal lathe configured with a fixed drill bit of the right size for the hole—Michael carefully measured the bolt's diameter inside the threads, even. A few minutes later I installed the screweye. Then I went and drilled the holes and installed the eyebolts at the other end. 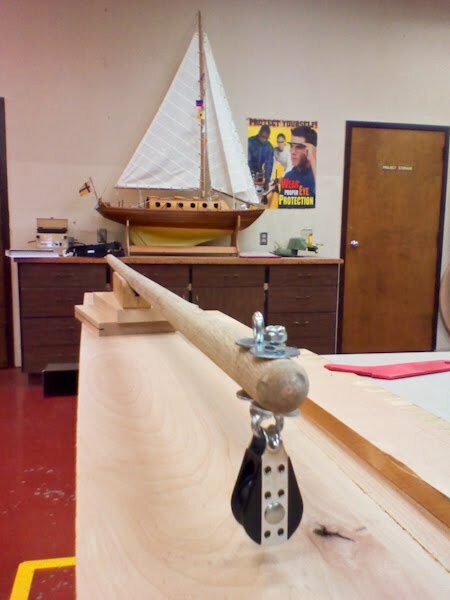 Now that I think about it, a metal lathe is quite a bit beyond the "simple hand tools" that one needs to build one of these boats. And with care, and probably some frustration, I could have managed it on my own. But I am very grateful I know the people I know, and am more grateful for the assistance they provided me today.